Place half of rice in a 9 x 13 pan and pat slightly w/a rice paddle. Layer fukujin zuke then shio fuki kombu on rice. 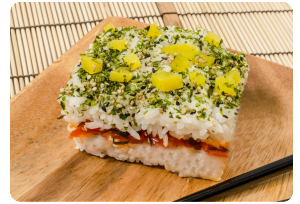 Layer remaining rice, pat slightly, then top with furikake. *Optional – Chopped takuan or shredded Beni Shoga ginger can also be used as a topping.